Refused to put his businesses in a blind trust. Signed state tax legislation that gave him a $100,000 tax break on a land deal. Received gifts from lobbyists after signing a sweeping order to ban such gifts. Filled state agencies and boards with business partners and political donors. Allocated state funds to projects that benefited companies he created after his time in office. Took joy rides in state helicopters. In addition, U.S. Department of Agriculture records show that from 1996 to 2004, Perdue received more than $278,000 in federal farm subsidies. Here are five key questions the Senate Agriculture Committee should ask Perdue before he is placed in charge of a $140 billion-a-year agency – the sixth-largest budget in the federal government – with wide-ranging responsibility for farm policy, food safety and the protection of natural resources. What qualified Perdue to receive more than $278,000 in farm subsidies? Perdue received more than $278,000 in farm subsidies between 1996 and 2004. During most of that time, he was also running three businesses and serving in the state Senate. In his first two years as governor, Perdue received a sizable payment through the peanut buyout program, as well as direct payments for wheat – both likely as a result of him being a landowner, not necessarily a farmer. Although he had a financial interest in farms, there is scant evidence that he was “actively engaged” in farming, which is now an eligibility requirement for subsidy recipients. Was Perdue like thousands of other city slickers whose land ownership made them eligible to receive subsidies that should be flowing to family farmers? Will he put his agribusinesses in a blind trust? Perdue has started or been associated with well over a dozen agribusiness companies and limited liability corporations: Houston Fertilizer and Grain Co. in 1976; Perdue, Inc., a trucking company, in 1993; Perdue Family Limited Partnership, LLC in 1996; and AGrowStar, LLC, a grain buying company, in 1999. 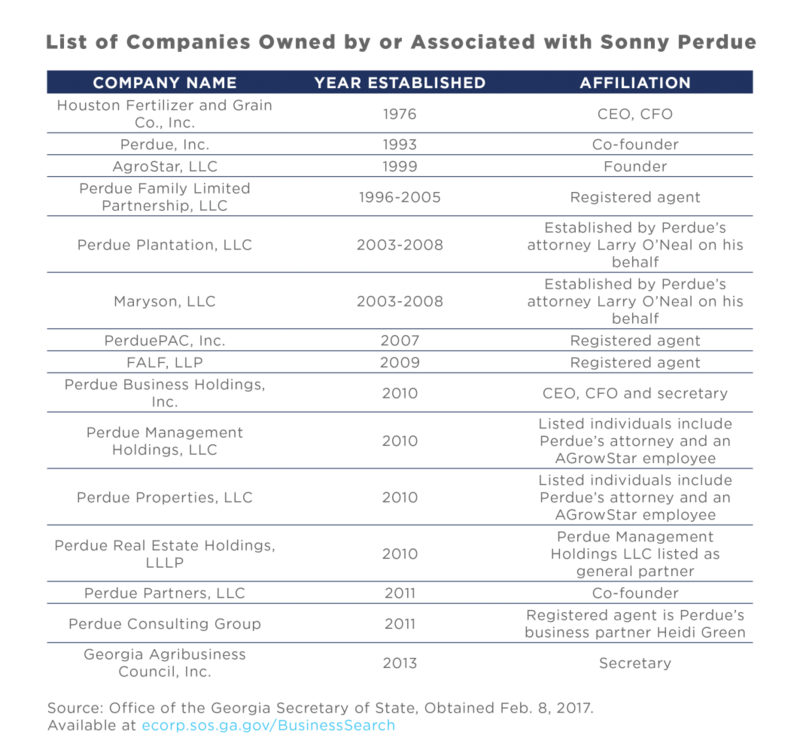 In his last year as governor, Perdue’s attorneys created four companies, including Perdue Business Holdings, Inc.; Perdue Management Holdings, LLC; Perdue Properties, LLC; and Perdue Real Estate Holdings, LLLP. Since leaving office, he has created at least two new companies – Perdue Partners, LLC, and Perdue Consulting Group – and he also serves as secretary for the Georgia Agribusiness Council. I am a small business owner; I’m in the agri-business. That’s about as blind a trust as you can get. We trust in the Lord for rain and many other things … [A] blind trust is not functional for a small business person. Will he commit to putting his substantial agriculture-related businesses in a blind trust if confirmed as secretary of agriculture? Did Perdue steer state funds to projects that benefitted his post-gubernatorial companies? Perdue also appointed key figures in his administration – who later became his business partners – to positions of power. For example, he appointed his cousin, David Perdue, to serve as a member of the Georgia Ports Authority – he was elected as one of Georgia’s senators in 2014. At the same time, his administration helped steer nearly $200 million to upgrade Savannah’s port. After he left office, Sonny Perdue, David Perdue and two top Perdue Administration officials – Trey Childress and Heidi Green – created a new business that moved goods through the port. Did Perdue’s business partners steer state funds to his old businesses? As governor, Perdue appointed his businesses partners to government positions where they oversaw the allocation of state funding. In 2003, Perdue appointed the general manager for Houston Fertilizer & Grain Co., Inc. – Jacob Redmon – as an Agriculture Representative on the Georgia Development Authority. Perdue also appointed AGrowStar’s general manager Danny Brown to the state's Georgia Agricultural Exposition Authority. But, Perdue was still listed as CEO of Houston Fertilizer & Grain, and both Redmon and Brown continued to work for these companies. Were either of these companies the beneficiaries of state funds? Will Perdue follow federal ethics laws? During his first run for governor in 2002, Georgia’s State Ethics Commission forced Perdue to return $30,000 in illegal campaign contributions from three of his own companies – Houston Fertilizer and Grain Co., Inc., AGrowStar, LLC, and Perdue Inc. While in office, Perdue failed to meet his own ethical standards by repeatedly taking gifts – including sports tickets and first-class flights – from registered lobbyists. Shortly after taking office, Perdue signed his first executive order, which prohibited any state official from accepting gifts worth more than $25 from lobbyists. 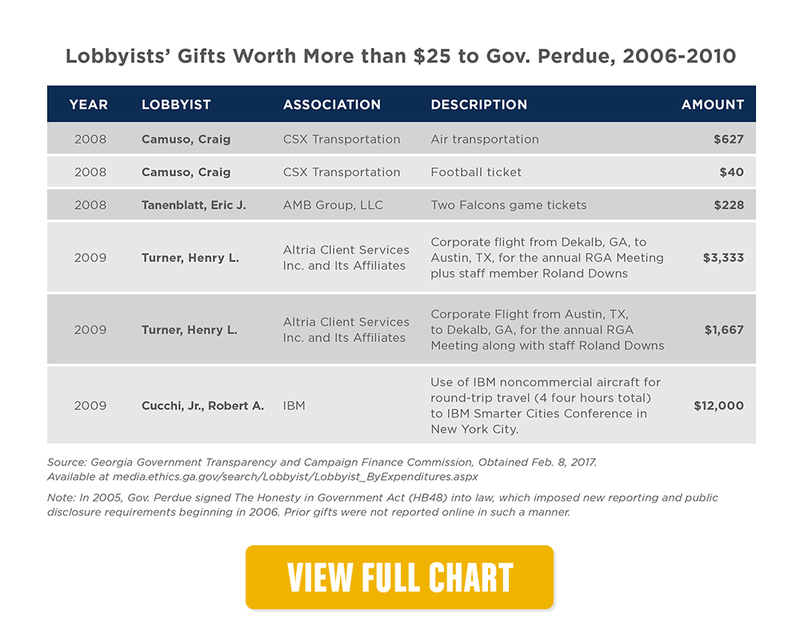 However, a query of lobbyist expenditures shows that Perdue received at least 53 gifts from registered lobbyists over the monetary limit – totaling more than $23,000 – between 2006 and 2010, including a $2,400 flight to a NASCAR race. In 2003, the Office of the Inspector General – an office established by Perdue’s second executive order – investigated whether Perdue’s personal use of state helicopters was appropriate, ultimately leading the Office of the Attorney General to prohibit such uses. Will Perdue follow federal ethics rules if confirmed as secretary of agriculture? Did Perdue block a state wildlife preserve to boost the value of his own land deal? In 2004, the lumber giant Weyerhaeuser Co. offered to sell a 20,000-acre property in Houston County called the Oaky Woods preserve, which was popular with hunters and environmentalists, and had been leased by the state as a wildlife preserve. But the state declined to bid on the property and turned down an offer by the Nature Conservancy to buy the property. Instead, it was sold to local developers, who planned to build 35,000 homes. Before the sale of Oaky Woods, Larry O'Neal – a state representative and one of Perdue’s personal attorneys – registered a new Perdue company, Maryson, LLC. At the time, Stephan Holcomb – a dentist and another Perdue political appointee – was the sole officer listed for Maryson. 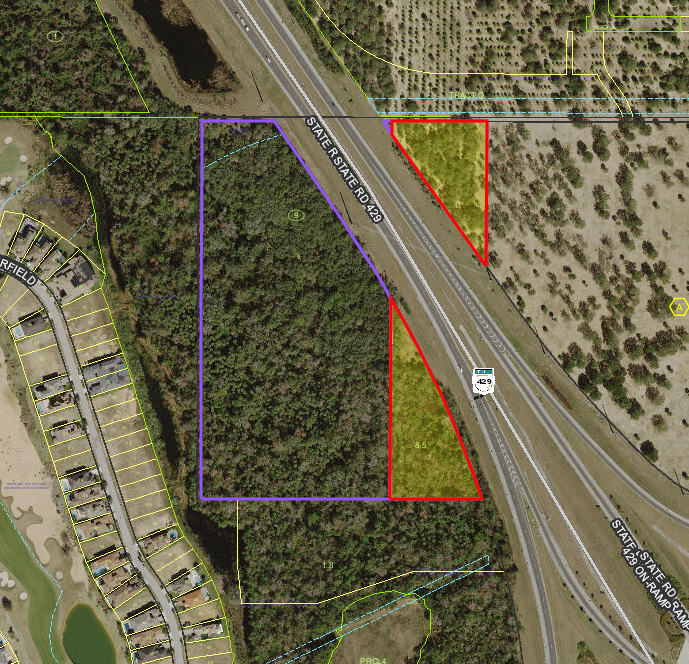 But Perdue reportedly negotiated on behalf of Maryson to buy the 101 acres next to Oaky Woods. The deed was transferred into his name in 2004 and he finally disclosed the acquisition in 2005. The value of Perdue’s 101-acre property doubled after Oaky Woods was sold to developers. Did Perdue use his power as governor to block the purchase of the land as state wildlife preserve? Did Perdue knowingly sign state legislation that netted him a $100,000 tax break? Florida for $2 million. He bought it from a wealthy developer named Stan Thomas, who Perdue had appointed to the state Board of Industry, Trade and Tourism the year before and who was a major donor to the Republican Governors Association. On April 12, 2005, Perdue signed a tax bill (HB 488) into law, which provided him a $100,000 tax break. Under pre-existing state law, Perdue would have been forced to pay taxes on the profits made by selling land in Georgia, unless those profits were used to buy similar land in the state. The new law signed by Perdue expanded this exemption to out-of-state land swaps, and was changed at the last minute to be retroactive to Jan. 1, 2004, covering Perdue's Florida land deal. The bill’s sponsor and the architect of the provision making the tax break retroactive was none other than Larry O’Neal, Perdue’s longtime real estate attorney and chairman of the state House Ways and Means Committee. Perdue repeatedly claimed that he was unaware that the new law would benefit him, but a memo obtained by the Atlanta Journal-Constitution shows otherwise. The memo to Perdue from Rebecca Sullivan, his deputy executive counsel, recommended that he sign the bill. [ii] In her explanation, she wrote, “Sections 9 and 14 repeal the requirement that certain federal like kind exchanges (those where the replacement property is located outside Georgia) are taxable for Georgia purposes (1031 exchanges).”[iii] As a result of the Florida land deal, Perdue was audited by the Internal Revenue Service in 2007. Although the deal netted Perdue a tax break, he has not made any money – so far. According to the Associated Press, the 20 acres that Perdue purchased in Florida was appraised at $185,700 in 2006 and the amount increased to $642,800 in 2007, far less than the $2 million he gave Stan Thomas to buy the property. [i] Dan Chapman, Ethics Watch; Perdue Starts Trading Company. The Atlanta Journal-Constitution, April 9, 2011. [ii] James Salzer, Perdue Had Explanation of Tax Break. Atlanta Journal Constitution, Dec. 18, 2006.